If creating new blog content has been a challenge, use these five simple tactics to plan and write new blog posts in as little time as possible. Almost every freelancer and business owner I have ever built a WordPress website for loves the idea of a blog. They have heard that blogging is the fastest and easiest ways to increase website traffic, improve search engine rankings, build a big email list, gain expert positioning, and attract new clients—and they want to achieve all of that. They have also been sold on the idea that leveraging a blog to get new business is free, which they love. But blogging isn’t really free and blogging for business isn’t exactly easy. Blogging is a long-term strategy. For most site owners, this means there isn’t an immediate return on investment and in an instant gratification society, this causes huge amounts of frustration, leads to ongoing procrastination, and results in the blog being ignored. So while many clients love the idea of blogging, the blogs created for them sit dormant, doing nothing to help the business generate leads and get more clients. This also means that your clients aren’t probably not seeing the results they want from their website. Similarly, many freelancers have blogs but rarely post new content. They’re so busy with sales, marketing, business management, and actually doing the work they are hired for, that there isn’t enough time to blog. Can you relate? Do you like the idea of having a blog, but feel overwhelmed by the realities of managing a blog and creating new content regularly — great content you can be proud of? If you answered yes, you’re not alone. The good news is all of these blogging concerns and frustrations can be overcome. With advance planning, creating new blog content can be fast and easy. The key is organizing blog posts before you need them. With advance planning, creating new blog posts can be fast and easy. The key is organizing blog posts before you need them so you have a library of blog post ideas, draft content, and even the best images already at your disposal. Inspiration for a blog post can strike at any time. Create a place to write down blog post ideas so you have them to reference in the future. You could do this in a software program, a journal, or on your phone. I use the Notes App on my iPhone because it syncs to my iMac and MacBook and I can quickly access my list of blog post ideas anywhere I am. This approach works wonders when you don’t just write down the topic idea, but also add context to the idea by also writing down details. Any story that may fit with it (this is a lifesaver, as you think you’ll remember it, but you may not). Inspired by a tweet, Instagram post, or Facebook post? Snag the embed code now so you don’t have to hunt for it later. It’s important to jot down everything you can about the topic when inspiration strikes. Don’t overthink it. Don’t worry about writing in complete sentences. Don’t edit yourself — you can do that later when you’re writing the final blog post. This exercise is just meant to get the meat of the post out of your head. If you do this every time you have a new idea for a blog post, you’ll build up a valuable idea file full of blog posts that are already partway complete! Then when you need to write a post, you can grab one from your file, finish it up, and hit publish! This approach takes the stress out of coming up with a blog post idea later. If you’re anything like me, you may find that you often do your best work under pressure and against a deadline. You probably also notice that when up against a deadline, you get things done faster, which means your effective hourly rate is higher and you make more money. There is a saying that the work will expand to fit the amount of time it has, which is why when there are no constraints on your time, coming up with blog post topics often seems to take forever. This is why you need to use a timer. When working against the clock, it’s easier to tune out distractions, focus, and make quick decisions. At the end of this exercise, you’ll have a few blog posts are already halfway done. You’ll just need to finish them up later. Many of my great ideas don’t come to me when I’m sitting conveniently in front of my computer or at home with a journal nearby — and sometimes I can’t write them down, like when I’m driving or in the shower. If you can’t write down your blog post ideas, or you don’t like to write, you can still create blog content regularly. If you can talk about your topic with ease or communicate your idea clearly, you can create new blog content by speaking it! And, often speaking your content is much faster than writing because when we talk, we don’t judge, delete, self-edit, or criticize ourselves like we do when writing. Edit the transcript to create the final blog post—it is much easier and faster to edit existing content than it is to write new content from scratch. If you’re a visual person who is inspired by photos, start there. When browsing stock photography sites, images often inspire new blog post topics or content ideas. When that happens, save the image along with your thoughts and ideas to reference later. The only thing to be careful of with this approach is being sucked in by the stock photography sites and losing hours of your day clicking from one page to the next. Set a timer for 15 minutes and visit your favorite stock photo site. Search for images on a topic relevant to your brand. This approach gives you a bank of blog posts that have already been partly planned out and the featured images to go with them, which means no searching for the perfect image later. One of my favorite ways to brainstorm new content ideas and outline new blog posts is to sit somewhere cozy and relaxing with a good old-fashioned pencil and paper. In fact, most of the articles I write are first written by hand on paper, then cleaned up and edited as I type them. Some people just find that creativity flows faster and easier on paper instead of a screen. If this is true for you, own it. Get yourself a new sharp pencil or a really great pen and some quality paper, or a beautifully designed journal. Then write and write some more — it doesn’t have to be full sentences or complete thoughts. Just use it as an avenue to get ideas out of your head. In this scenario, you’re focusing on really flushing out all of your thoughts, ideas, and opinions on one single topic. This approach is often my go-to strategy for mapping out the content for longer, more in-depth blog posts. 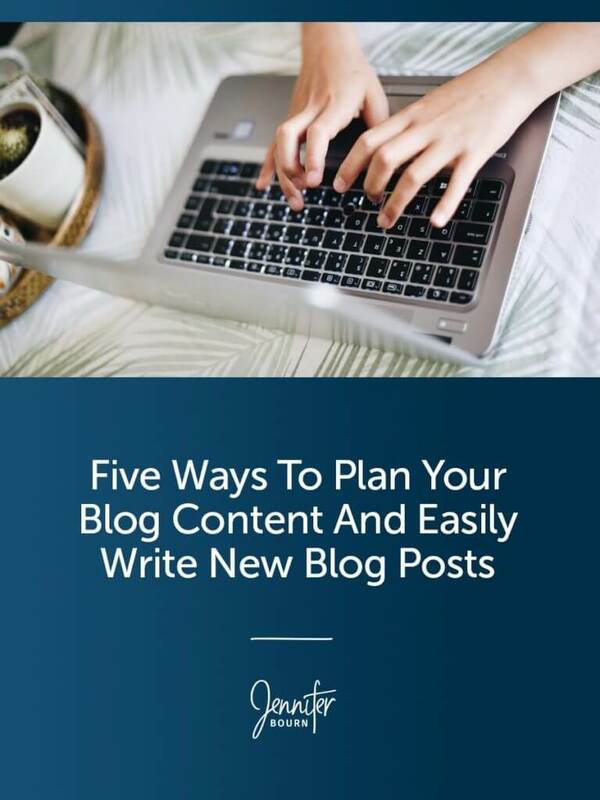 If creating new blog content has been tough in the past, I highly recommend you give each of the five ways to plan blog content and blog post topics a try. You need to see which approach works best for you because only when the process feels comfortable and easy, will you be able to stick with it for the long-term. Just remember, the more detail you provide about your blog post topic up front, the faster and easier it will be to write the full blog post later. The embed code of a tweet, Facebook post, or video you want to reference, so you don’t have to waste time hunting for it later. If you can do this, you’ll be getting all of the heavy-lifting done up front, so planning blog content will be easier and writing blog posts will happen faster. And, if you use this same approach with your clients, you can help them finally leverage the blog you created for them and enjoy better results from their website, which in turn will result in better testimonials and more referrals.